Synergy Entertainment Featuring the Synergy Band. Synergy Entertainment is also a full service Entertainment Company that can supply DJ's, Jazz, Classical, Reggae, Latin, Italian or Jewish musical ensembles. 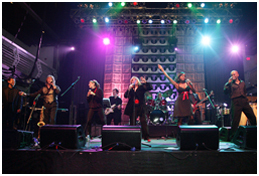 We can accomodate both large and small parties or downsize band according to your budget. Comprised of professional musicians with years of experience in the New York recording industry. Synergy is the one band that can truly fulfill all your requests. Synergy offers the flexibility you desire and the professionalism you deserve. 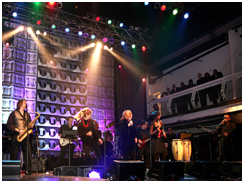 By combining over 20 years of New York success, Synergy allows you to paint the musical spectrum. With two female and two male lead vocalists, accompanied by a complete horn section, Synergy can make any party jump with continuous music. The bandmembers' list of professional accomplishments include performing and recording with artists such as Grant Greene, Kid Creole and The Coconuts, The Drifters, The Marvellettes, Slave, Billy Cobham, and Melvin Van Peebles.